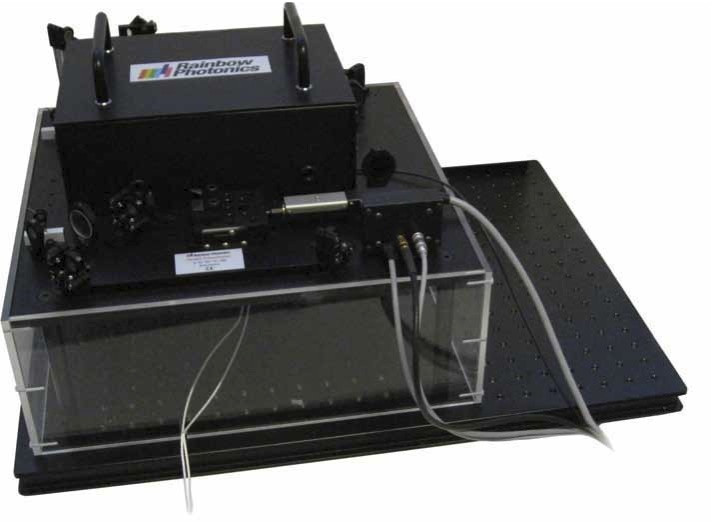 The TeraIMAGE® offers a flexible solution for laboratory THz spectroscopy and imaging. It is based on organic crystals, to allow access to THz frequencies not yet available with conventional antennas. The TeraIMAGE® includes all optical, mechanical and electronic components for the generation and detection of THz waves such as delay line, THz generator, detector, optics, electronics, dedicated software and laptop. It also features a scanning mechanism for the measurement of phase and full-spectrum images. As the TeraKit®, it can also be used with various telecom wavelength lasers. Spectroscopy and imaging of various materials. Ideal for identification and detection of dangerous substances and biomedical materials, as well as for materials testing of plastic, special polymers and semiconductors. The scan area is 5 x 5 cm2. We also offer systems that allow imaging of larger areas.